Total MSRP includes the starting MSRP for vehicle plus any options selected by you. Destination charges, taxes, title charges, license/registration fees and all other dealer charges are excluded. Actual dealer price will vary. Specifications, equipment, options, and prices are subject to change without notice. Some items may be unavailable when vehicle is built. Ask your dealer about the availability of options. 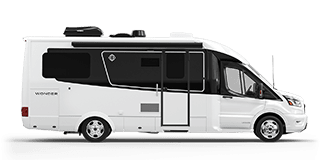 Your custom configured Leisure Travel Van has been saved and can be accessed from the Build & Price page.